Thanks Fred! I never thouht of the corrolation between the top angle and the railing. Lashing the topgallant masts and yards against the central gratings is tempting as it would look interesting, but should have been unconvinient when they wanted to cover the cratngs during bad weather. Yes, storing stuff on the gratings is not the most convenient, but it was done. 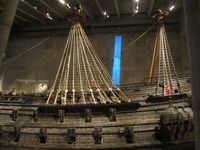 Later ships sometimes had a rack for spars built above head height over the gratings to solve this. The other alternative, to store spars on the chainwales, is the most likely. They are out of the way there but not so hard to retrieve when needed, and the find locations for the surviving yards suggests that they were stored on the chainwales. The main chainwales are easily long enough to hold the topgallant masts or any of the upper yards. Do you mean that they would be laying behind the deadeyes or lashed in front of them? What side of the ship do the finding locations suggest? There is no area outboard of the deadeyes, so it would be better to have spars stored behind the shrouds. FInd spots suggest that both sides of the ship were used this way. I'm wondering about these parts. What are they called? Is it a question if they should be there? I ask since Clayton didn't add them to his build. I actually did add those to my build, and they are the mainsail sheet blocks, so are for controlling and holding back the lower corners of the mainsail. It is actually one of those things that Fred suggested that I add/improve after I was nearly done with my rig, so if you look at pictures taken before he gave me advice on how to improve, you will get the impression that they were not added. Ah I see, thanks Clayton! The feature is the lead block for the mainsail sheet, which turns the sheet to run back forward, where it is taken inboard through a hole in the bulwarks to belay on a cleat above the gunports. Other ships typically use a single block stropped to a ringbolt, but this leads to the block battering against the side of the ship. This fixed block avoids the problem. Both of the lead blocks survive, including the sheaves, so we are confident of their appearance, size and location. They are quite large (almost 2 meters long) and show up on a model of any scale. I can post a drawing if you like. Thanks Fred! I enjoy your drawings so it would be interesting to see. I'm wondering what this rope is and where it should be fastened. I can't tell by the reference and plans I have. Is it fastened around the mast together with the lanyards? That is one of the mizzen mast tackles, and there is one on the other side too. The leg of it goes around the masthead like a shroud does and the lower end of the leg has a loop in it and the is tied to a loop in the strop of the upper block. If memory serves me correctly they are are installed before the shrouds are. I think that both of the blocks in the tackle are single sheave versions. The main and fore mast tackles are a bit more complex than these. Also if my memory is right, the lower end is belayed around itself on the lower block hook, or at least that is how I did it on my model. Fred can probably give more details. Thanks Clayton, that's exactly what I needed! Hi, i would like to stick to your topic, I'm also making rigging. Little bit different could be that model is made of matches. Sorry for my bad english, but I'm still learning. Welcome Michael, and nice work on your model! I think what you are referring to as hoods are mast caps. They are for holding the topmast or topgallant mast in place and aligned with the mast below it. 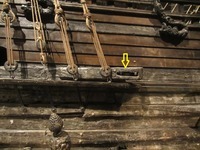 In Vasa's case, there would be a strip of iron holding the topmast or topgallant mast to the cap that goes around the front side of the mast (like the right side of the picture above). The rope that you have circled in the picture of my model is a toprope. It is for lowering the upper masts out of their set position during heavy weather or when not in use. 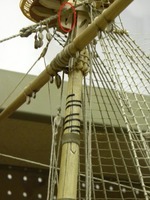 It is fastened to one of the ringbolts on the underside of the cap, goes down through the hole in the top and through a sheave in the end of the topmast (as you have circled) then back up to a block on the other side of the cap which is stropped to the other eyebolt in the cap and down to the deck. I think there is a standard side that the fast end and the block are attached to, but I forgot at the moment. Looking at more of my pictures might help you with that.